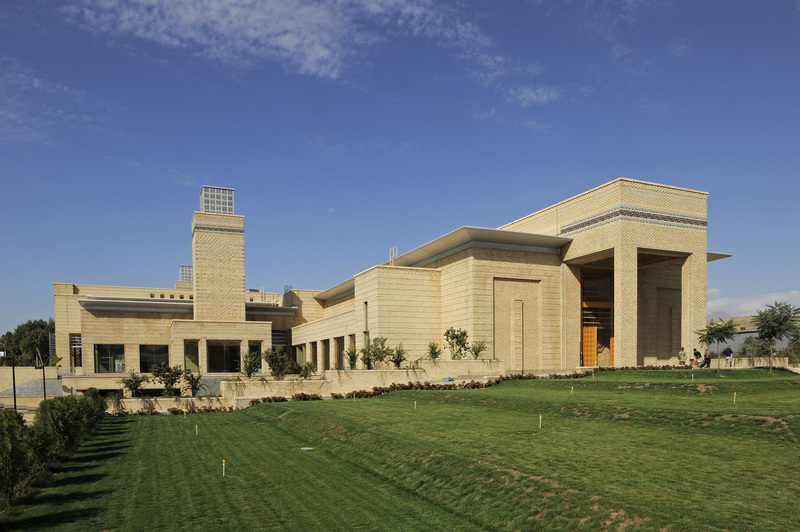 Looking across the lawn towards the Main Entrance of the Ismaili Centre, Dushanbe. 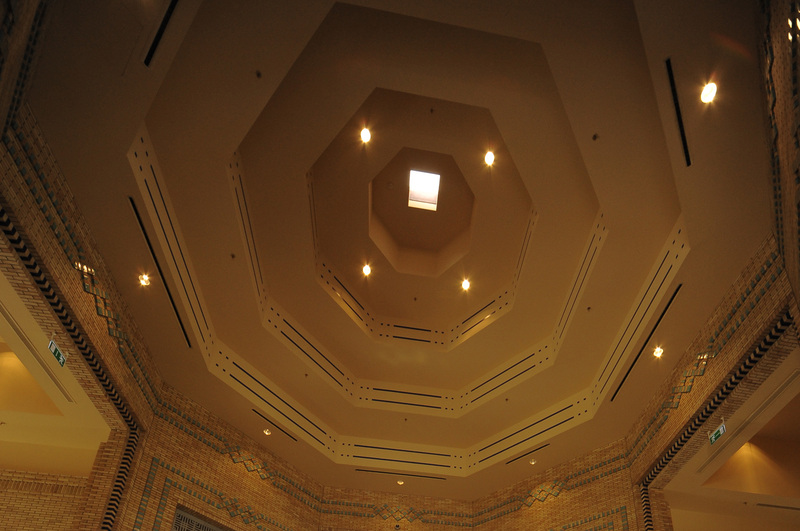 This skylight, in the foyer of the entrance to the Social Hall, is based on the traditional design of the roof of a Pamiri home. 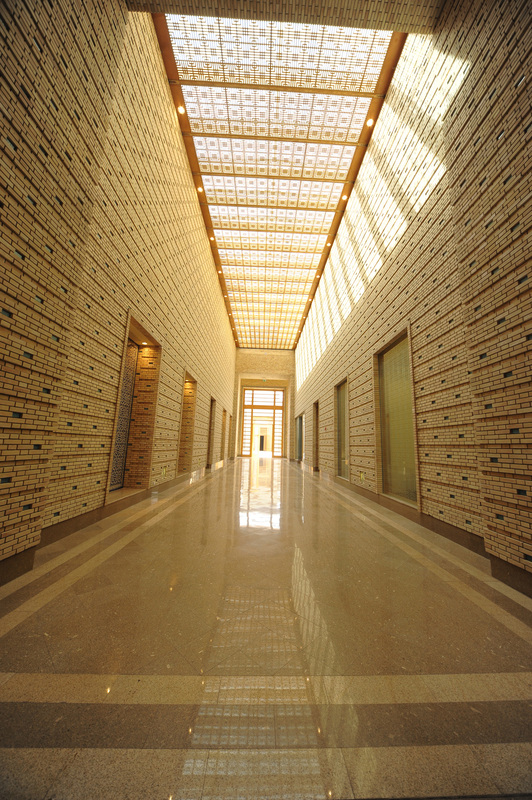 The mingling of wood with masonry and tile lends warmth to tall interior spaces. 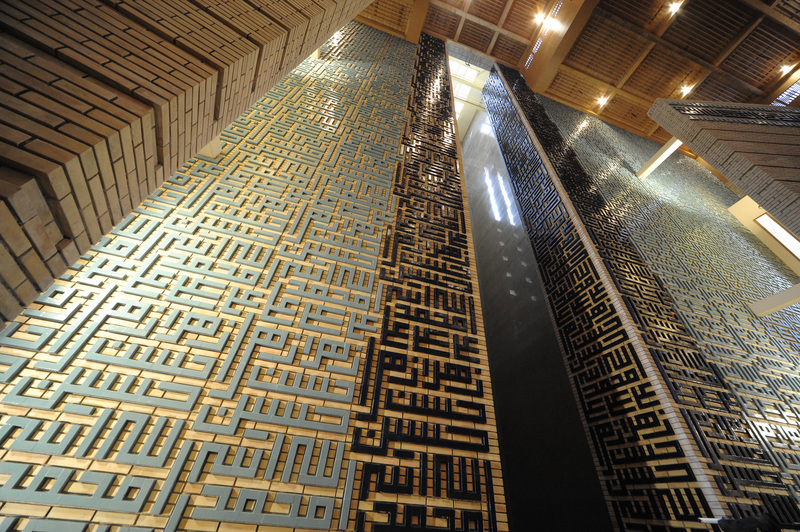 The striking blue tiles, mounted in specially created niches, were hand made by master artisans in Central Asia using traditional craftsmanship. 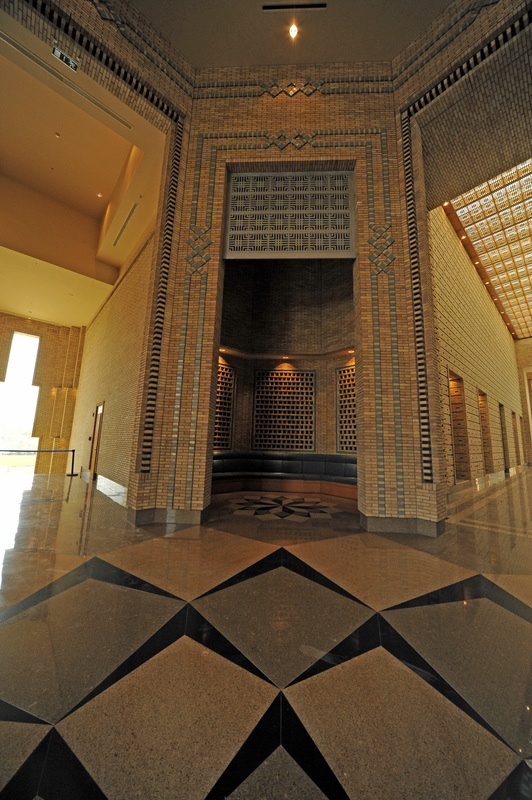 A view from the foyer towards the Prayer Hall Anteroom. 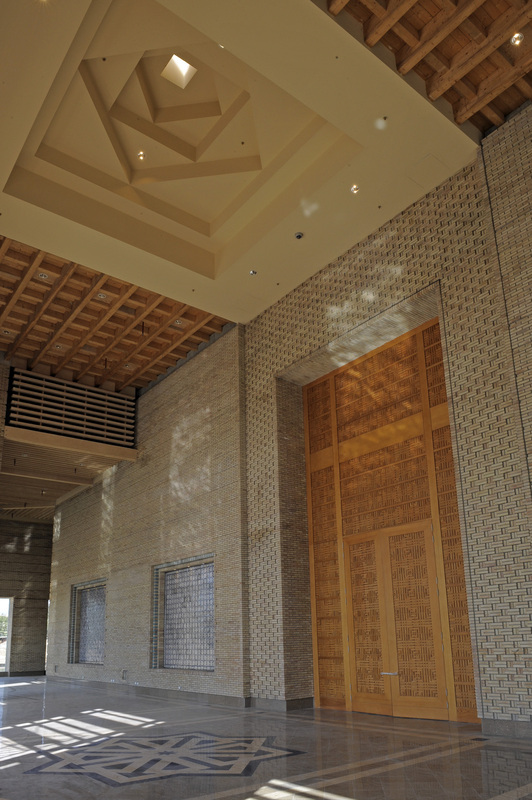 Brick patterns and the calligraphy crowning the walls are among the prominent textures that characterise this space. The Great Courtyard with the Social Hall Portal on the left and the Prayer Hall portal on the right. A reflection of the Youth and Education Portal is visible in the window of the Social Hall. 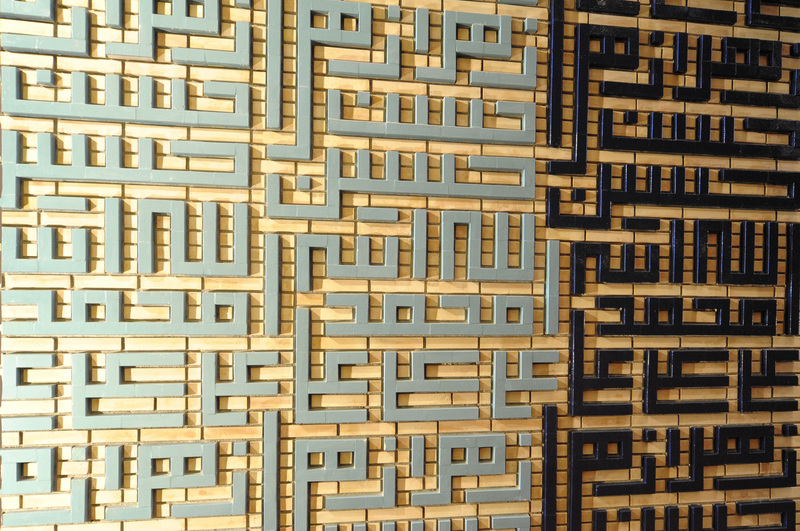 A detailed view of the calligraphic patterns, reciting “Allah”, “Muhammad”, “Ali”, “Hasan”, “Hussain” and “Zahra”, inlaid in brick. 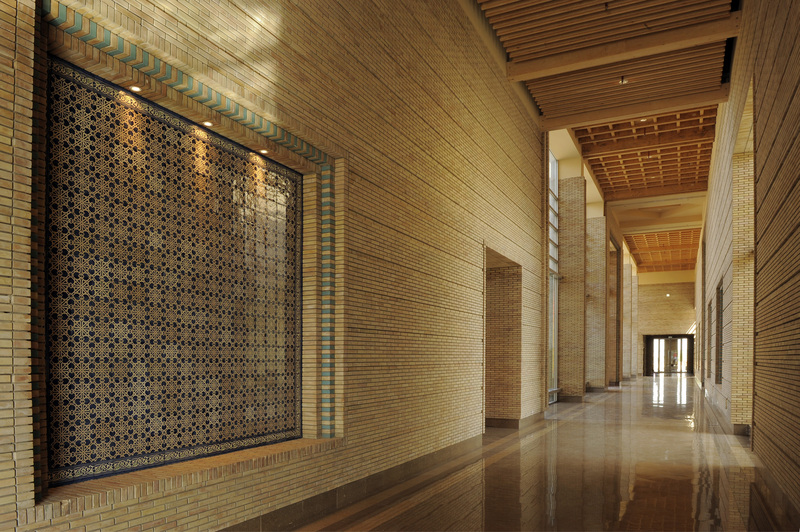 Light, cast across a wall of calligraphic repetition of the names “Allah”, “Muhammad”, “Ali”, “Hasan”, “Hussain” and “Zahra”, is the dominant feature of the Prayer Hall. 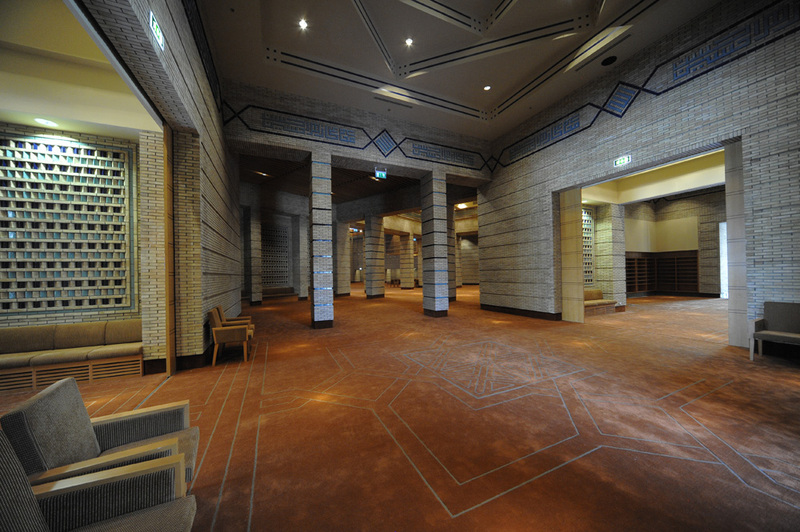 A view down the concourse between the Great Courtyard and the Prayer Hall space, looking towards the Literature Centre. 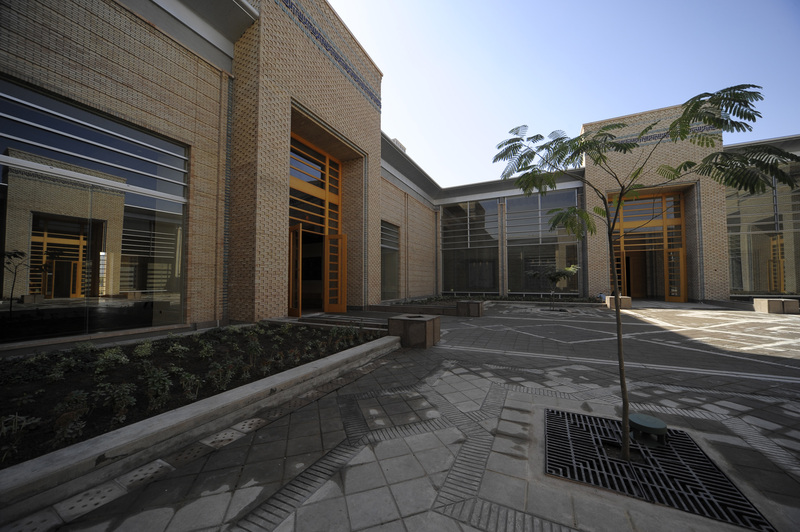 Looking out from the Prayer Hall Portal, across the Great Courtyard, towards the Administration area. Looking up at the Youth and Education Portal from the Great Courtyard. 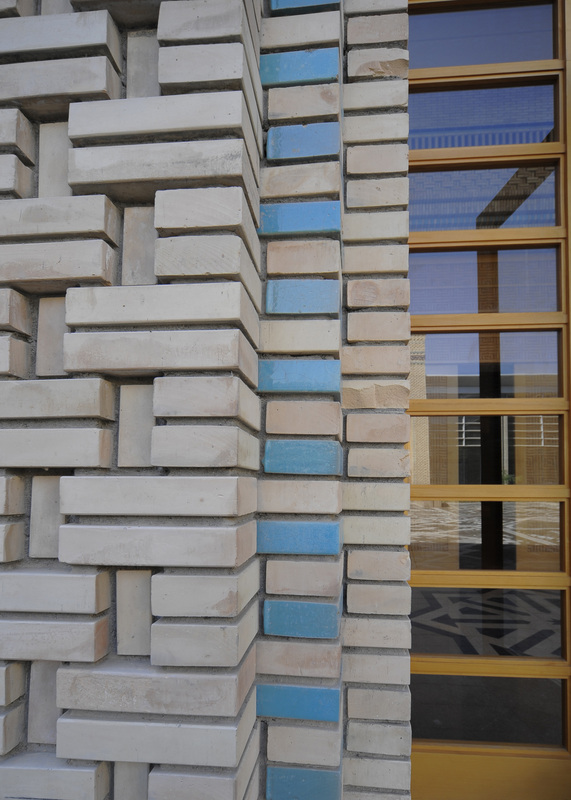 Clay bricks, woven in a variety of patterns, are the most distinctive aspect of the complex. 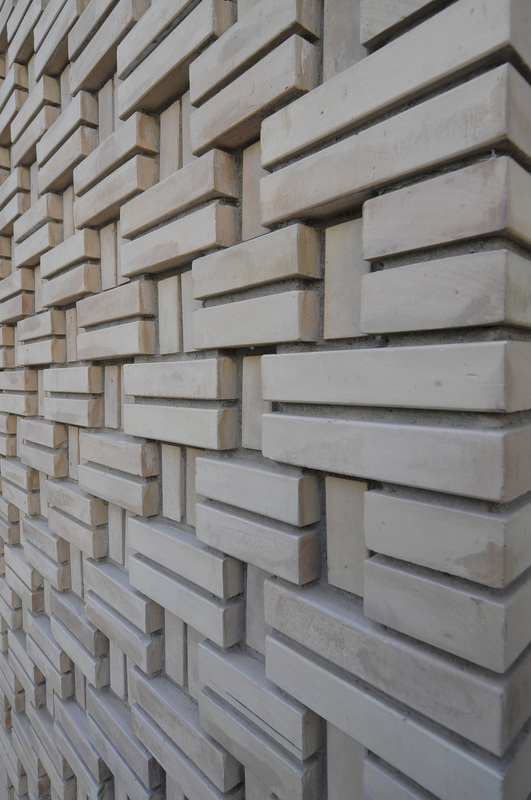 Lines, textures, colours, and images intersect in brick, wood and glass. An aerial view of the complex shows the Main Entrance on the right, the Social Hall Entrance on the left and one of four corner water features in the middle. 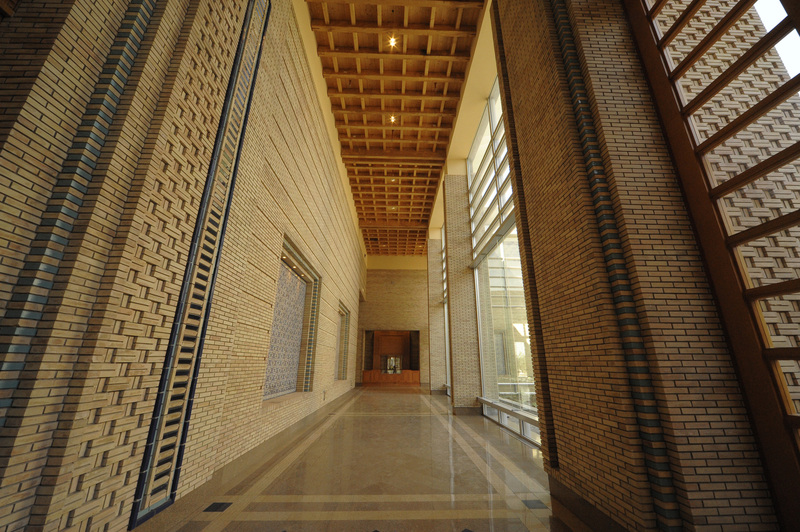 A view from the Main Entrance shows a seating alcove on the left, a reception desk on the right, and the axial corridor of the Administration area leading to the Great Courtyard. The ceiling above the foyer at the Main Entrance in the Administration area. An alcove at the Main Entrance of the building. 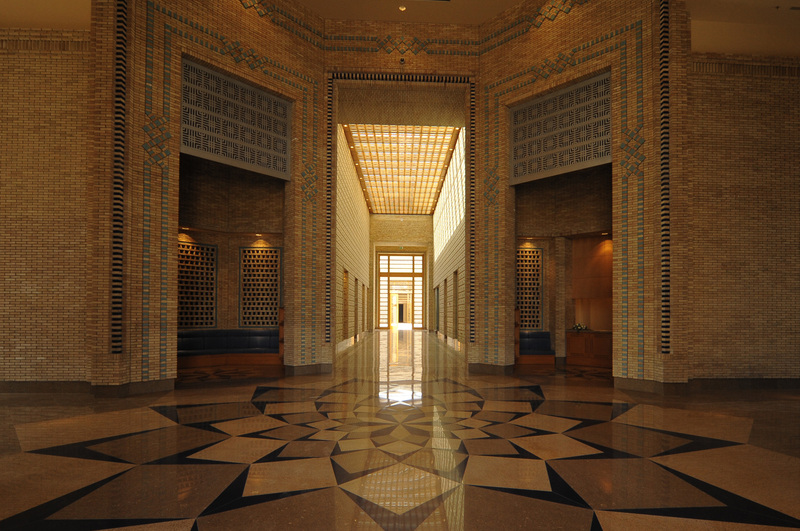 Notice the granite floor patterns. 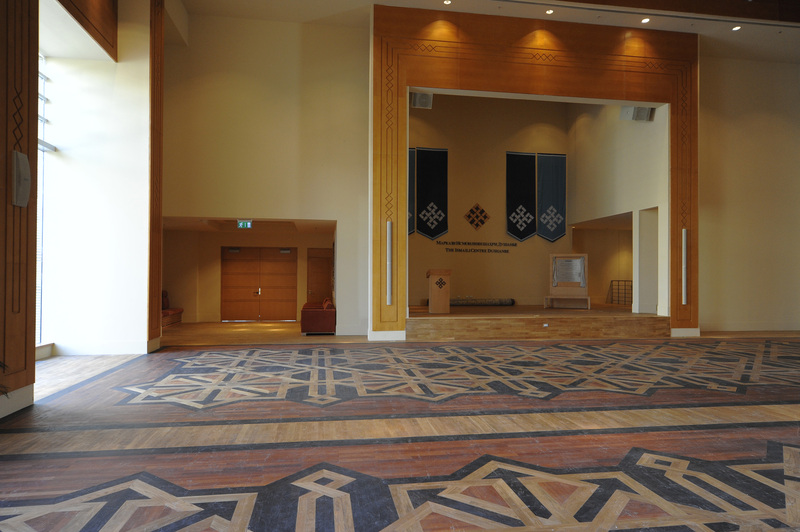 The intricate, inlaid pattern of the Social Hall floor incorporates three different types of wood, adding to the elegance of this space. 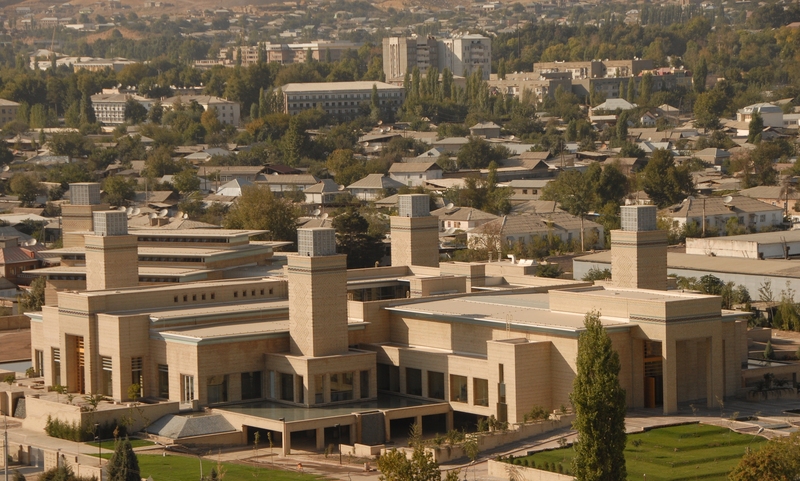 An evening view of the Ismaili Centre, Dushanbe. 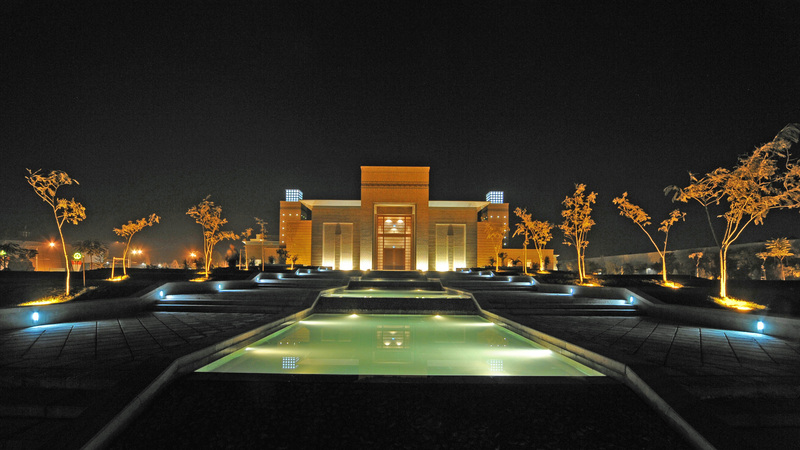 Pedestrian walkways line the cascading water feature, leading to the building’s Main Entrance. 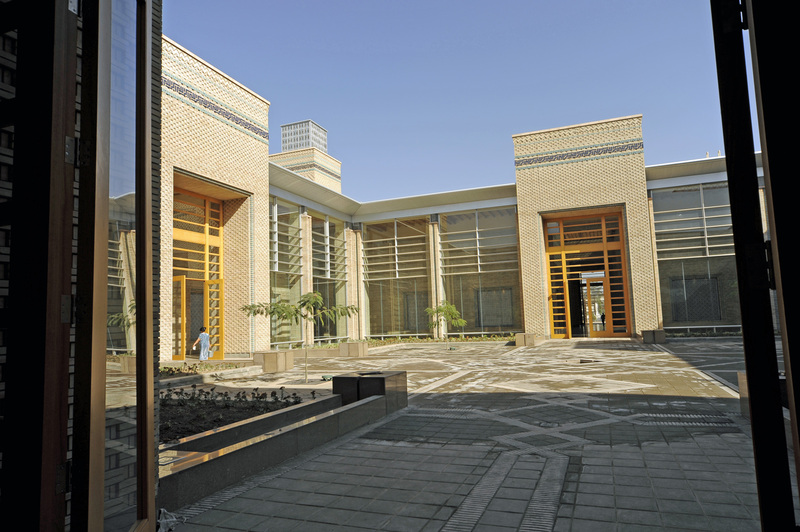 Inspired by some of the region’s most distinctive monuments, the architecture of the Ismaili Centre, Dushanbe blends many different craft and artisanal traditions of Central Asia. 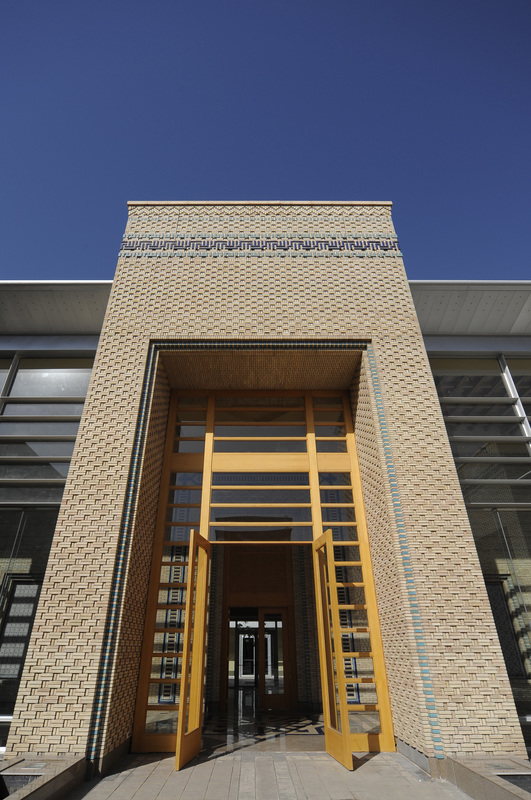 Built in sandstone baked brick and glazed blue and turquoise tiles, it acknowledges the vernaculars of the 10th century mausoleum of the Samanids as well as the grand courtyards of Samarkand, Bukhara and Khiva.